Squamous cell carcinoma is a form of skin cancer that is usually due to the fact that you have had too much sun exposure, even if you have not burnt yourself. Squamous cell carcinoma is becoming more common, most people who get it are cured after treatment. Squamous cell carcinoma is rare in under 40 years of age. The most common symptom is a hardening or blemish somewhere on the skin. It can be the same color as your own skin or be light red. It is usually on the face, on the scalp it is bold, or on top of the hands. It may be covered by hard scabs and be scaly. It can sometimes be sore when touched. There are also other types of skin cancer, such as malignant melanoma and basal cell carcinoma. Actinic Keratosis is sometimes referred to as solar keratosis. It is a pink or reddish-brown spot with unclear edge and scaly surface that can be from millimeters up to a few centimeters in size. It is common to be on the face, on the bare parts of the scalp or on the top of the hands. After many years in can change in appearance and turn into an invasive squamous cell carcinoma. It can sometimes be confused with malignant melanoma, basal cell carcinoma or squamous cell carcinoma, but also with eczema and other inflammatory skin diseases. Squamous cell carcinoma in situ, or Bowen’s disease, the cancer is has not fully developed and grows only on the skin’s surface. You get a redness spot, which can become a sore and peel. Sometimes it is misinterpreted as an eczema blemish. It is most common on skin that has been in the sun but can sit anywhere on the body. The spot can pass to the next stage and is called invasive squamous cell carcinoma. Invasive squamous cell carcinoma means that the cancer grows deeper into the skin. It usually looks like a very narrow hardening with hard scaly skin on the surface. It can be the same color as the skin or be pale red. Sometimes the cancer turns into a crusty sore. The cancer can also look like an irritated wart that is painful to the touch. Squamous cell carcinoma is most common in the face, neck, on the scalp or top side of the hands. You can also get invasive squamous cell carcinoma in chronic ulcers or scars after a burn or after radiotherapy. Hi I am a 54 years old man. This raised spot appeared approx 2 months ago and has stayed roughly the same size. It is on my right leg, on the side of my calf muscle. I doubt it’s relevant but I have foot drop on that leg and therefore have reduced feeling in the leg. Thank you for sending your case. 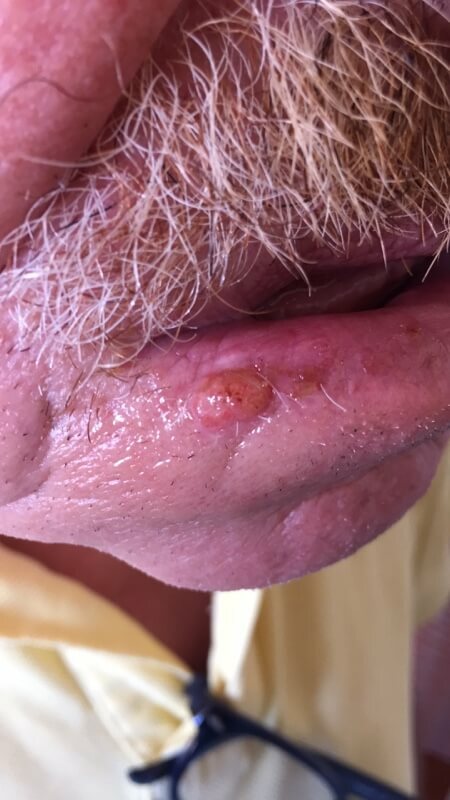 Based on the information and images, this is possibly a SQUAMOUS CELL CARCINOMA:: It is a common type of skin cancer that often develops in sun-exposed areas. It grows locally for a long time before in rare cases it spreads to lymph nodes and distant sites. A biopsy may be necessary prior to treatment.  I recommend that you see a dermatologist in order to confirm (or rule out) the diagnosis and discuss the most appropriate treatment option in your particular case. I am a 34 years old female. It is localized on my stomach, approximant 1,5 cm in diameter. Circular. Hard consistency in the middle, just like a piece of nail. Based on the information and images submitted, this is possibly a KERATOACANTHOMA: Keratocanthoma is a relatively common, low-grade (unlikely to metastasize or invade) skin tumor that is believed to originate from the neck of the hair follicle. Many pathologists consider it to be a form of squamous cell carcinoma, the second most common type of skin cancer. It is commonly found on sun-exposed skin, on the face, forearms and/or hands. I recommend that you store these images and this answer, to bring them with you to the dermatologist to confirm the diagnosis and discuss treatment options. I am 62 years oId male. I live in Thailand since 8 years back and I play a lot of golf. I have an itchy and burning sensation on my lip for a few months now. Then from time to time it creates a crust that falls off and it comes back again. Thank you for submitting your case of your right lip. 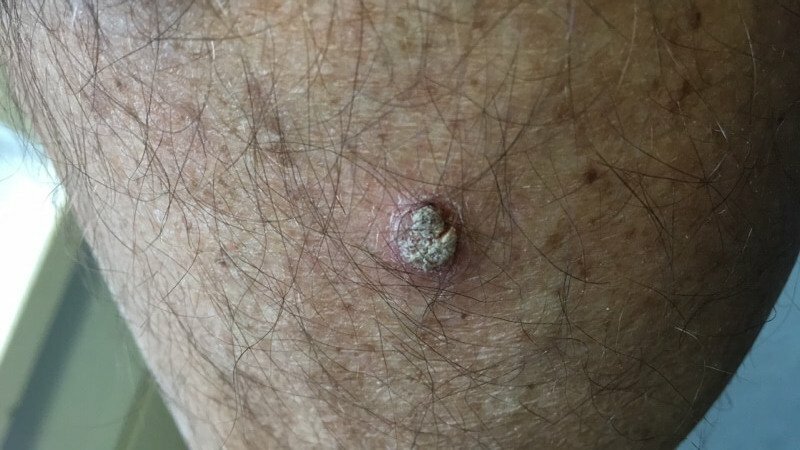 Based on your history and your photos, this is possibly a SQUAMOUS CELL CARCINOMA: squamous cell carcinoma is a common type of skin cancer that often develops in sun-exposed areas. It grows locally for a long time before in rare cases it spreads to the lymph nodes and distant sites. It is very important that you see a dermatologist right away to have it removed surgically. I am a 53 years old woman. I have a mole on the left arm for years. It keeps scabbing, crusting and has changed over time. It is about 3 mm. I have had basal cell cancer before. Thank you for sending your case of the arm. 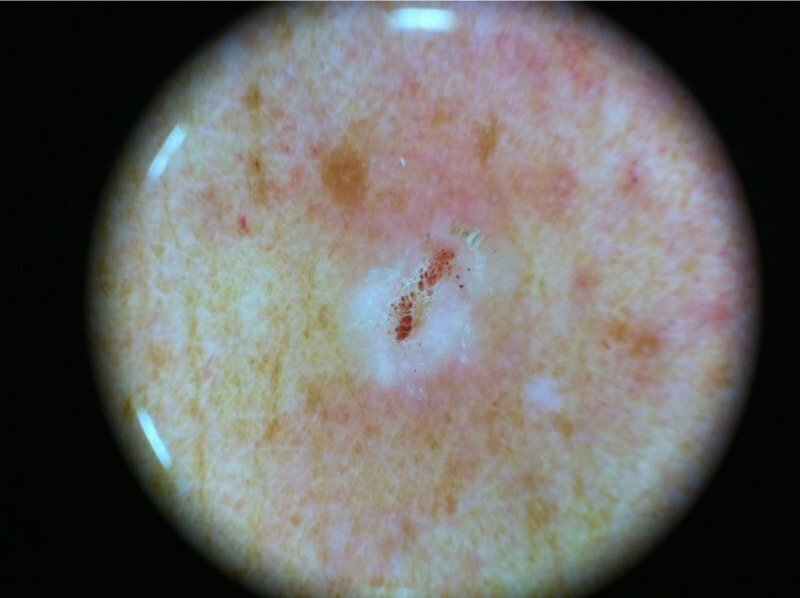 Based on the information and dermoscopy image, this is possibly a SQUAMOUS CELL CARCINOMA. 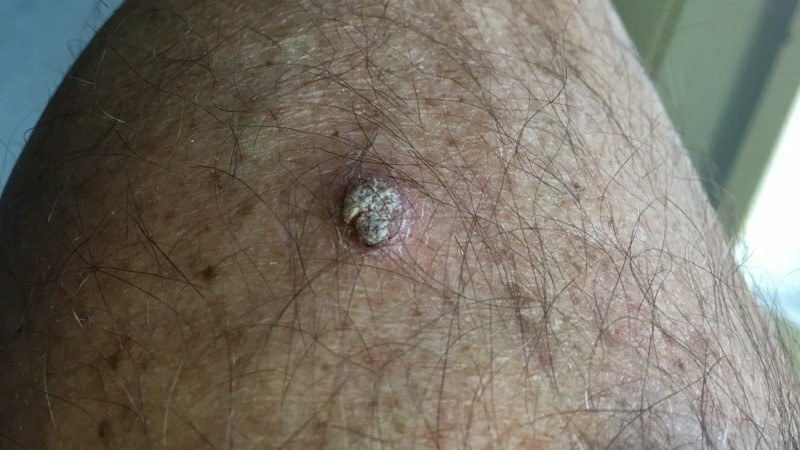 This is a relatively common skin tumor, the second most common type of skin cancer. It is commonly found on sun-exposed skin, on the face, arms (as in this case) and/or hands. Since the lesion is rather small, I recommend that you excise the entire lesion with a 4-mm margin to confirm the diagnosis and hopefully to cure the patient.